Every retirement is a blank canvas. What you choose to create with it is entirely up to you. 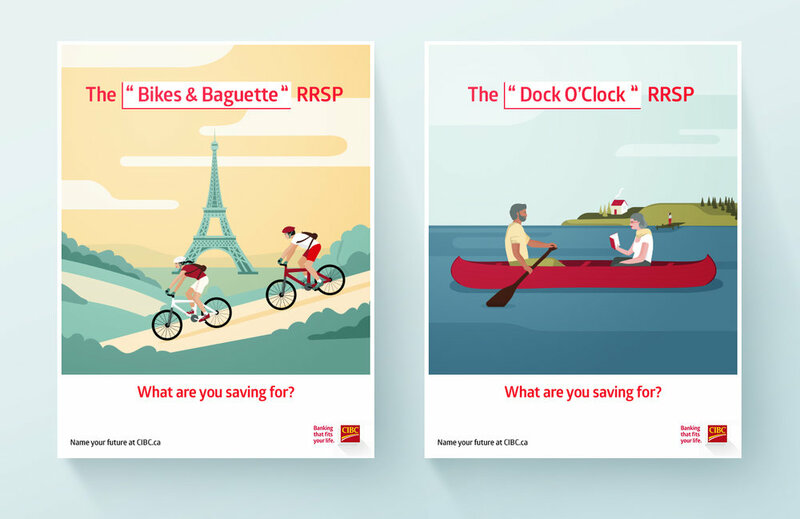 So, to inspire Canadians to save for their dream retirement, we’re going to find Canadians who’ve used their blank canvas to paint masterpieces. We’ll scour the country for individuals who have used their retirement to do amazing, unique, and adventurous things. We’ll find people who have pushed boundaries. Who have surprised themselves. Who have lived out childhood dreams. Then we’ll tell their story in quick, compelling videos that can be shared online. Google Vogon Preroll, - Dynamic 6 sec based on what people search. For example, if someone is searching for yoga might encounter an ad for “The Namaste RRSP,” while someone searching for hiking would see “The Blaze-A-Trail RRSP” banner. Over 80 unique ads based on different “futures” viewers might have.